What was largely left unsaid during the recently concluded Presidential election campaign that saw the election of Donald J. Trump, was that trade treaties and their impact was not the whole picture when it came to the issue of the decline of good well-paying jobs in manufacturing to those without a college degree. The reality is that many of these same jobs in the US, and the UK have been also disappearing due to advances in technology, particularly with respect to automation, over the same period. Remarkably, this fact received little notice whatsoever in the recent campaign in the US although for some experts this trend has had just as much of an impact as it relates to job losses in the US- over the last two decades – as has been the migration of manufacturing jobs to Mexico and Asia. The problem though is in terms of employment. Today, most manufacturing in the West and increasingly globally, is highly automated, doing far more with far less in terms of physical labour. Take a look at any photo online and see how automobiles and vehicles are manufactured today on the shop floor. If you find a human in any of these photos it would indeed be a rare sighting, almost akin to spotting an extinct species. I exaggerate somewhat, but I think that you get the point. 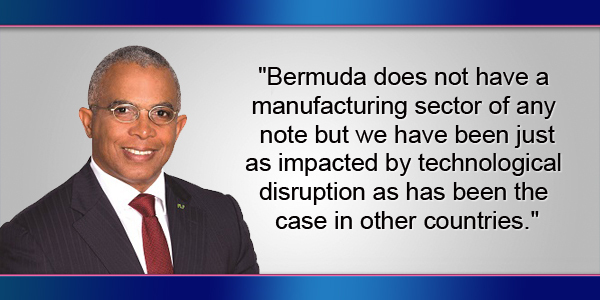 Bermuda does not have a manufacturing sector of any note but we have been just as impacted by technological disruption as has been the case in other countries. We have lost hundreds of jobs over the last fifteen years or so due to the adoption of automation in a number of sectors of our economy. Particularly in our banking sector, post 1998. The next major disruptive trend to take place is likely to occur in the International business sector with the introduction of block chain technology. This technology will allow the industry to harness the power of distributed computerized networks or what is commonly referred to as a block chain. This will mean that the companies will be able to maintain their respective transactions electronically on a single, shared ledger that more importantly cannot be tampered with or fraudulently altered. The savings will be tremendous. Block chain technology – along with other advancing technologies – such as that which is associated with “Insurtech” or insurance technology, an analogue of “Fintech” [financial technology] – will revolutionize the way that financial services overall, including risk management services are managed. As Michael Coles of Cedant recently asserted in the daily, it will place the driver and centre of innovation in the global industry in Silicon Valley, California and not Bermuda. Although Bermuda based firms stand to profit tremendously by the early adoption of these and other technologies. Take a look at what is happening in terms of the explosive growth of ILS or the Insurance Linked Securities sector on island which essentially is a platform for the securitization of risk as it relates to the global insurance/re-insurance industry. Bermuda is now the biggest player in the ILS space and stands poised with its growth to become the preeminent global centre of the industry. But most Bermudians would never know it, as its impact on employment has been largely tepid at best for many of the same reasons highlighted above. Simply put, the employment footprint in the industry is shrinking even while the industry itself continues to grow. What of the deployment of artificial intelligence platforms? As we move into the next decade AI will create whole new market eco systems and leave significant amounts of disruption in its wake, including scores of white collar professionals with graduate and post graduate degrees from top universities. It will literally replace tens of thousands of professionals over the next decade who now specialize in professions, such as underwriting, actuarial and legal services; not to mention many others currently positioned fairly high up the corporate ladder. It is incumbent therefore that Bermuda must continue to re-imagine and re-invent itself as it relates to both our private and public sectors. There are titanic shifts occurring globally that we cannot ignore. We simply cannot trust the OBA to engineer this transformation as they represent the entrenched economic interests that is placing too much of a head wind to the kind of transformative strategic change that is needed. Concentrated economic power is the enemy here and the OBA represents that. But what is to be done in anticipation of these trends? Firstly, as mentioned in our Vision 2025 response to the 2016 Throne Speech we need to implement Job Corps as recommended by Columbia University’s Professor Ronald Mincy. We need to do this so that we can give our young people, especially our young adults, a second chance at securing technical and other forms of training, in order for them to achieve gainful employment with qualifications, in partnership with the private sector, so that jobs are waiting for them upon completion. This would include training in information and communications technology [ICT]. Secondly, let ensure that all of our public schools have WI fi and those students without tablets are able to obtain them. Thirdly let’s ensure that STEM [science, technology, engineering, math] and/or STEAM learning take pride of place in terms of priorities along with establishing targets for the teaching of coding and robotics to our students. Fourthly, we should commit to enlisting the Oracles of the world and Bermudian institutions such as the Bank of Bermuda Foundation who could partner to provide the seed money [$600,000.00 est.- held in escrow] that would underwrite the hiring of at least six or seven specialists and/or mentors to teach STEM subjects. An initiative such as that – done independently of the Department of Education– could really take STEM learning in the public school system to the next level. Public private partnerships like this in the US have worked very well. Just as importantly let’s also ensure that are young students are immersed in the development of critical thinking skills at an early age of their development. This is key. In the economic development front let’s really make a national push to establish Bermuda as a regional fin tech hub as previously noted. In addition, let us make a firm and unwavering commitment to the green economy with hard targets in terms of implementing an alternative, renewable energy future for Bermuda dependent upon solar, wind and other emerging technologies. This should not be an option but rather a national priority of the highest level. Let’s us get it done by 2025 and in the process create a whole new industry for Bermuda. A recent New York Times story reports that globally, “more than half the investment in new electricity generation is going into renewable energy.” And this represents over $300 billion in investment, per annum. The Progressive Labour Party believes that government can be a force for good and can be the catalyst for facilitating economic growth around key strategic investments. We will also need to have a robust national conversation on the implementation of a legally mandated living wage regime which would include a minimum wage for Bermuda to tackle the scourge of income inequality. No one working forty hours per week or more in Bermuda should be forced in making make that Hobson’s choice between either, being a member of the working poor at home; or becoming an economic migrant abroad, by relocating to the United Kingdom, as too many already have. The election of Donald J. Trump and the Brexit result clearly show us that the geo political order is changing and will continue to do so. To paraphrase the words of William Butler Yeats, things are falling apart and the geo political centre clearly cannot hold. The advent of 2017 truly represents a time of great risks and peril; but along with that a time of great opportunity. I would also add that I think we are missing a huge opportunity by not eyeing up Brazil as a potential market for us here. Same time zone, emerging economy (despite current issues) — it will be a powerhouse in 20 yrs time, just in time for current primary school students! We should be teaching Portuguese in schools here which would allow future generations to effectively target Brazil as a market (for int’l business or fintech). Brazilians are often made to speak Spanish or English when dealing with other markets; we could very much positively differentiate ourselves. It’s a living language here so practice is easy; a cultural language of Bermuda. Plus, it’s much easier to learn Spanish if you speak Portuguese, but not the other way round. Why teach Spanish where we have to compete against millions of 1st generation Americans that are bilingual? Sounds good to me “ct”. We really have to be forward thinking here. This is bigger than purely PLP or OBA. We need more critical thinkers on both sides of the aisle. Rolfe, please!! The OBA is way ahead of you in this regard. Rocky5 you stated: Rolf – front row of the 1st day of the “Tweed “business” interruption march” you revealed yourself as being a person who has a love for money and not for humanity. You did not mention that children were not able to go to school. Capitalism is really organized crime which is beneficial to those of European descent. Therefore capitalism has been a detriment to the minorities and the poor. I agree with alot of what Rolfe has said here but he has offered precious little in terms of explaining how Bermuda will reap the benefits of increased financial automation. I am not sure that the recruitment of all these S.T.E.M teachers will go down with the ministry of Education! In a country that performs so badly at simply Math GCSE we would need to look at a revolution in teaching. Someone told him it will be great and he’s grabbing onto it. The government has little role to play in the world of Fintech other than perhaps some regulatory role. The Mincy Report was 2007 and the PLP failed to implement it for years. Now with few resources the OBA are doing a half-job with the NTB. Meanwhile the OBA are busy making real world improvements turning around tourism and undoing the destructathon of International business under the PLP. From a member of the destruction team!